I've been enjoying everyone’s guesses as to the names of the twins. I cracked up at the thought of granddaughters named "Rice" and "Beans". Ideal pseudonyms when posting about food so I will hereby refer to them as such. "Rice and Beans” weigh as much as large jícamas this week, although they are a heck of a lot prettier. (I can’t imagine a more homely looking vegetable than a jícama). 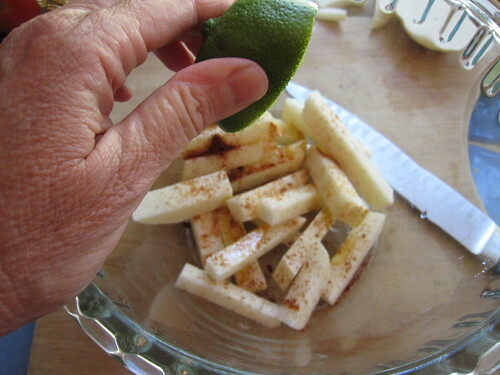 I have never really cooked with jícama …only cut it up in a salad or sliced on a veggie tray to accompany dips. But this week I wanted to stretch my jícama prowess and try some new ways of using it. 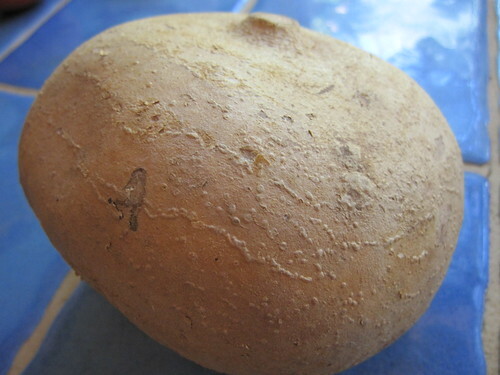 Jícama (pronounced HE-ca-ma) is a Latin American tuber and is related to the sweet potato. 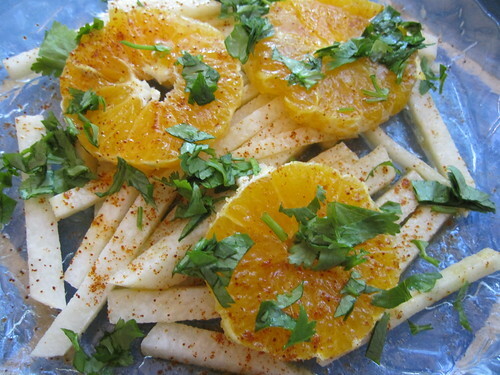 It is mostly made of water but because of that, is very refreshing and a crunchy and juicy addition to salads or slaws. Jícama doesn’t have a lot of flavor but is very sweet so kids love to snack on it. I used to cut up a big bowl of it and put it out for the kids when they came home from school. When buying jícama, pick out small ones as the big ones aren’t as sweet and are starchier. Jícama has a lot of nutritional benefits including a significant amount of vitamin C, a lot of fiber and practically no calories, so it is one of those foods that you can snack on all day. Since it is a root vegetable, you can roast it for a low carb alternative to potatoes, and it holds its crunchiness much more than its potato cousins. The roasting, as usual, brings out the flavor. You can juice it (add it to carrot juice or other veggie juices) and put it in stir-fries. Slice 2 oranges into ¼-inch-thick rounds and remove the seeds. 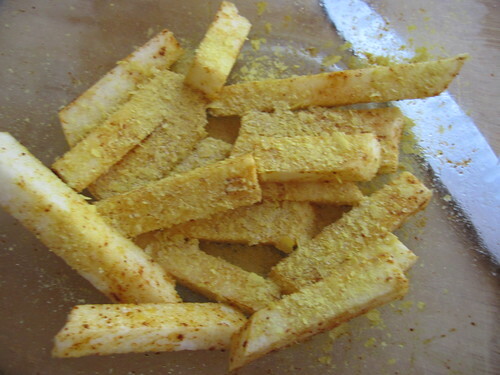 To make: Cut up a jícama into fry shaped pieces, sprinkle with chile powder, olive oil, salt, and nutritional yeast and toss. You can add some lime, too, for a little twang. These are delicious. The nutritional yeast tastes like powdered cheese when mixed with the salt. Or, you can bake the jícama tossed in a little olive oil at 375 and when brown, sprinkle the fries with salt, chile powder, and nutritional yeast, or Parmesan cheese. 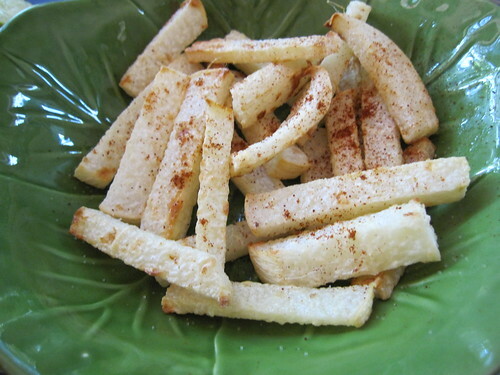 You can also slice thinly and make “jícama chips.” The baking makes them super sweet and scrumptious. My guess for the twins' names are Ruby and Bijou - I know Bijou was a possible name choice before, and Ruby sort of matches with it (both are jewels). I'm probably totally off the mark, but it's still fun to guess! 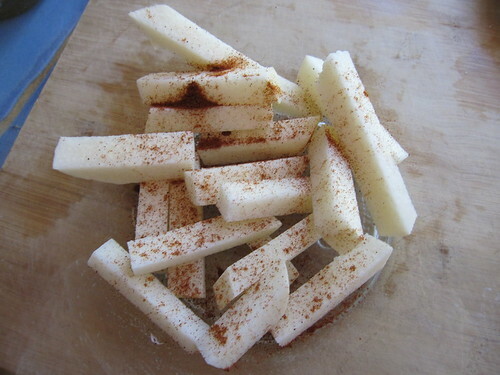 I love jicama with lime and chili powder. I won't even try to guess R&B's name. I'm sure they will have unique beautiful names. I don't think I've ever seen a jicama here in the UK but they sound lovely, maybe one day (years hence, when my littlies are bigger?) I'll make it over to try them. I had a feeling about the names the other day: Blaise and Rune. Blaise is probably too "known" as a name, but I like the sound of them together. Or Belami and Ripley. Or Beattie and Rue... so much fun contemplating possibilities. 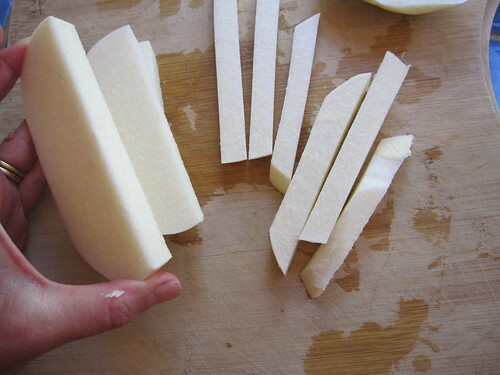 the jicama is not homely, merely unremarkable. homely is the elephant foot yam, my favourite tuber. also known as the elephant yam. google it if you've never seen one and marvel at the resplendent ugliness. I thought I didn't like jicama until I had it recently in a salad. Can't wait to try it roasted! I dreamed your twins' names last night. (I know, that's kinda creepy, right?) I remember being confused by the R name -- Reassa? Rheassa? I can't remember now -- and smug that I'd been right about Breanna. These don't seem to match up with your history of naming in nouns, so who knows why my brain picked them? But there you go. @ Anon - that elephant foot yam is quite impressive!! WOW! Wow WWW you have some amazing ideas about food and life (those bumper pads are perfection as are the curtains, stroller blankets, Fable's dresses, some of Archer's clothes (well the shirt I saw) and....). You also have so many vegetables to work with that we don't get in New Zealand but I would love to try! Jicama is one of them. 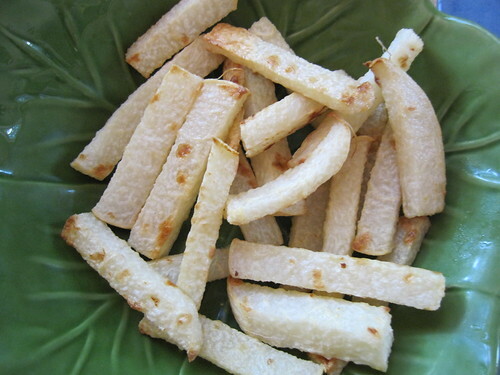 My 3-year old just asked for Jicama chippies for dinner (it'll have to be the humble potatoe sweety I said). It is so exciting waiting to know the names of the girls though I am happy that Rebecca's hunch of 22/11 means we might still get a few more Monday updates as I love those! Naming the babes is so special, and with Archer and Fable being such gorgeous names the girls are sure to have beautiful names too! Oh I really want to try these! 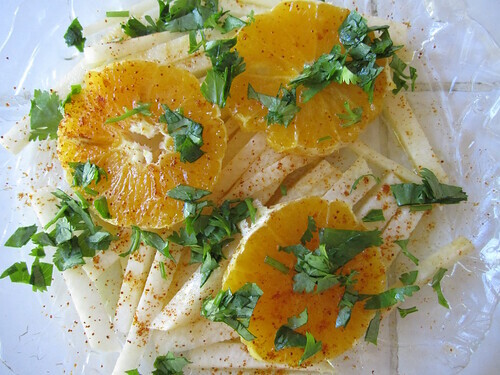 We've been scarfing down a mango jicama salsa all week, but I think I could do another dish! 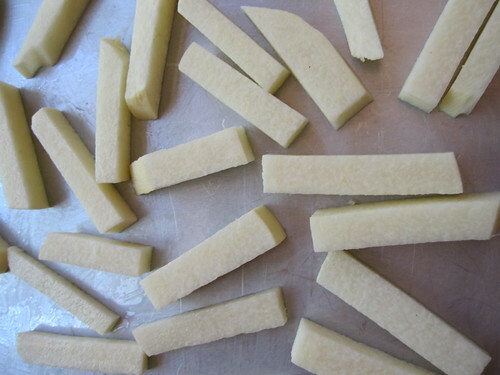 How does the jicama measure up in terms of nutrition compared to a potato or a sweet potato - am all in favor of trying the baked fries, as that is how we currently fix regular ole potatoes. But wanted to know if the jicama had a more nutritional aspect and if it was worth trying a "sneak" subsitute one evening. We often do baked fries (regular ole potatoes) - would the jicama be a good switch nutrition wise? Want to see if I should try it as a "sneak" substitute one evening. I LOOOOOOVEEEE JICAMA !! 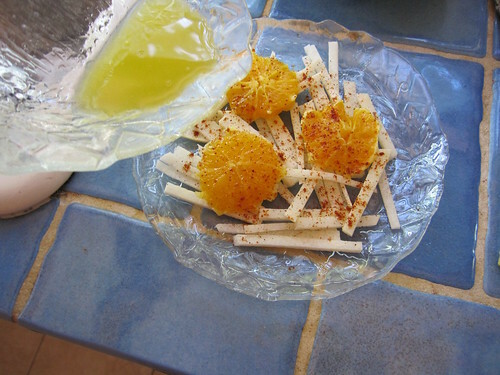 And this is a very traditional snack we eat in mexico : ) really any type of fruit with lime and chilli powder is the best and its super healthyyy !!! Its so funny you wrote this because I had the biggesy craving for jicama yesterday, so now im gonna head to my latino store and buy me some: ) gracias! 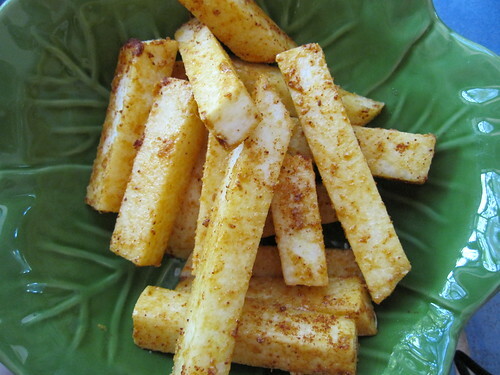 A cup of jicama provides 40 percent of the daily value of vitamin C (no vitamin A which a sweet potato is loaded with). It also provides about 16 percent of your daily folic acid needs. 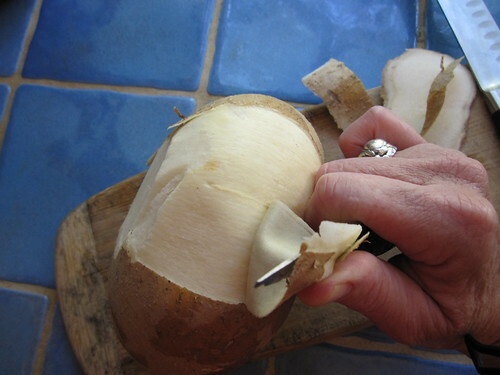 Jicama, per cup, is a moderately good source of potassium, too. It has very few calories, though, compared to a potato (it's less filling, also). 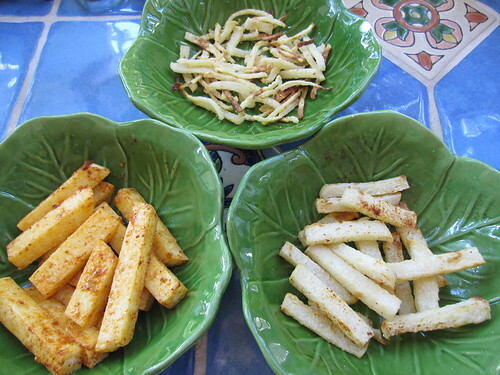 I think mainly it is a different flavor, a different texture, and it's great either cooked or raw so for me, it's just fun to try something different--not necessarily replace potatoes all together, but use jicama as a new side dish that is nutritional and fun to eat. Especially since we don't eat meat, I like to be cooking with many different vegetables so that we get a large range of amino acids (the building blocks of protein) in our diet. Wendy! thanks for the Jicama post we love this at my house(also hispanic decent) and we recently went on trip to Cabo San Lucas, MX, and my cousins had fish tacos! I know no big woop but the tacos were different cause instead of a tortilla they used JICAMA so it was a thin slice of Jicama then toped with the (beer)battered fish cole slaw(or pico de gallo) and like a strawberry sourcream or some sort of fruit sourcream it was delicious they stated it was the best fish tacos they ever had cause of the JIcama!! and soo much healthier!!! were making them this weekend here!! I love jicama! Filipinos eat them with shrimp paste. Not exactly healthy, but OMG. Food for the soul. We will have to get some of your food tips for our listeners! Cute site! you NEED to invest in some Tajin- found at a hispanic market. it's a little bottle of spicy chili, with lemon..and sprinkled over the jicama with some lime = omg yum!!! I will try your jicama recipe..during summer season jicama is very affordable and you can buy it anywhere.